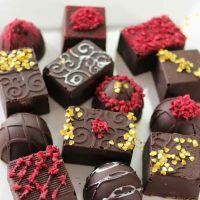 My recipe for Chocolate Raspberry Truffles first appeared on Grumpy’s Honeybunch where I am a contributor to her awesome keto series! These keto chocolate truffles are coated with sugar-free chocolate and filled with a creamy chocolate ganache. 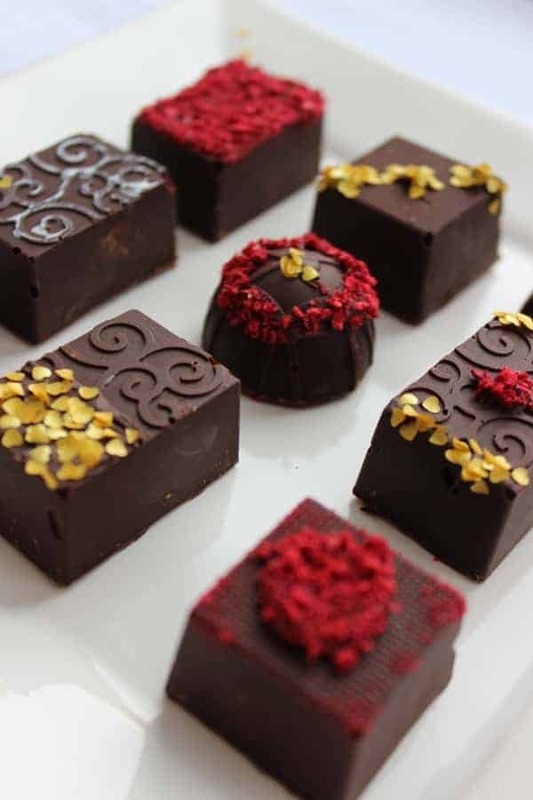 They can be decorated with crushed, freeze-dried raspberries and/or edible gold heart flakes for the perfect keto friendly valentine! Truffles are the perfect Valentine’s Day indulgence for two lovebirds. Or a thoughtful gift for your keto dieting partner. Imagine how surprised and delighted your partner will be to find that not only did you make something beautiful and delicious from scratch, but you’re also respecting their chosen way of eating. Get ready for your love to fall into your arms! These homemade truffles are a sugar-free candy that is so tasty and gorgeous, your partner won’t stop asking you if they’re really homemade. Yes, you read that right. As long as you follow the directions, truffles are just as easy as cookies or cake, but there’s no baking involved. It’s basically melting chocolate, pouring into molds…and eating! There are a few tips and tricks I’ll share with you to help you succeed in your homemade keto truffle making. 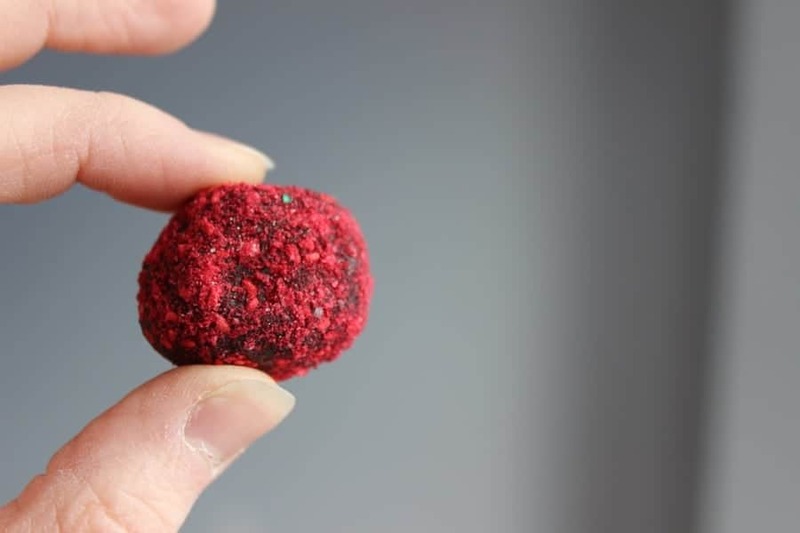 Honestly, I was surprised at how easy these raspberry truffles were the first time I made them. NO CHOCOLATE MOLD? NO PROBLEM! 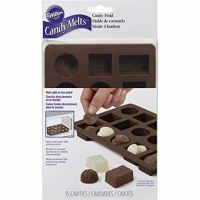 If you don’t want to buy a candy mold or want an even easier option, you can skip the coating part. You allow the ganache to cool, roll about a teaspoon-sized amount into a ball, and then roll that ball in either powdered erythritol or cocoa powder. That’s it! For those of you who are totally up for going all the way, silicone candy mold and all, you’ll find a link to purchase our favorite mold down below or follow this link. 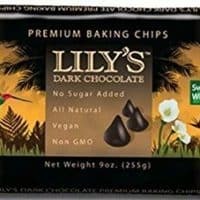 Perfect for low carb, keto friendly chocolate! 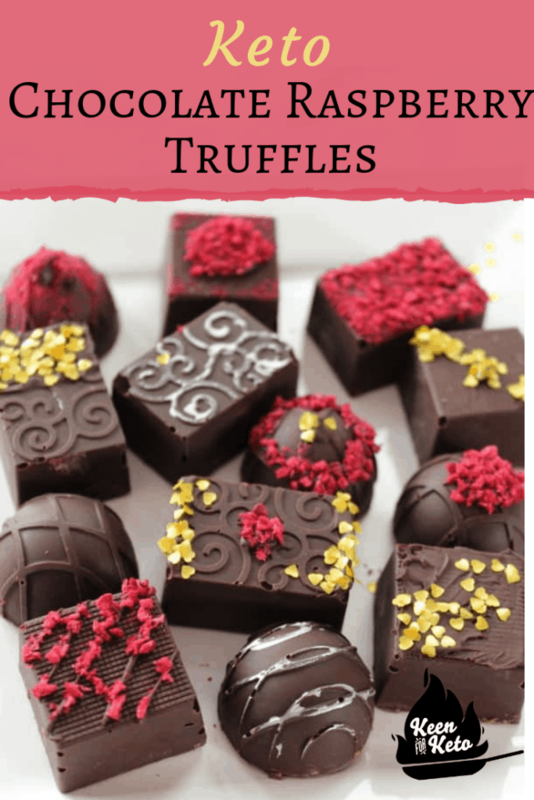 Or, an even better idea is to make some truffles in molds with the coating and then make some truffles the easy way without the molds and put them together in a fancy box. Then you can top them differently, too, if you like. A variety of truffles are so pretty! Looking for more fun truffle ideas? Try these Chocolate Orange Truffles and you can shape yours like a chocolate Christmas orange! If you’re worried about the chocolate hardening while you work on other parts of the recipe, you can always return it to the double boiler with the heat off. The water will still be warm enough to keep it from hardening, but not so hot to make it too runny. Don’t like raspberry flavor? Leave it out! Or try strawberry, cherry, almond, or peppermint–yum! Be sure to be gentle with the chocolate at all stages. When stirring, don’t stir too aggressively, or it will get bubbles in it and won’t look as pretty when it sets. When you pour the melted chocolate into the truffle molds the first time, gently tap the bottom of the mold till you see bubbles rising up. 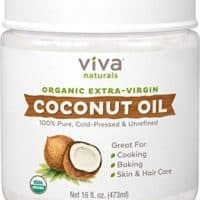 This will help to keep your finished keto truffles from getting bubble indentations. 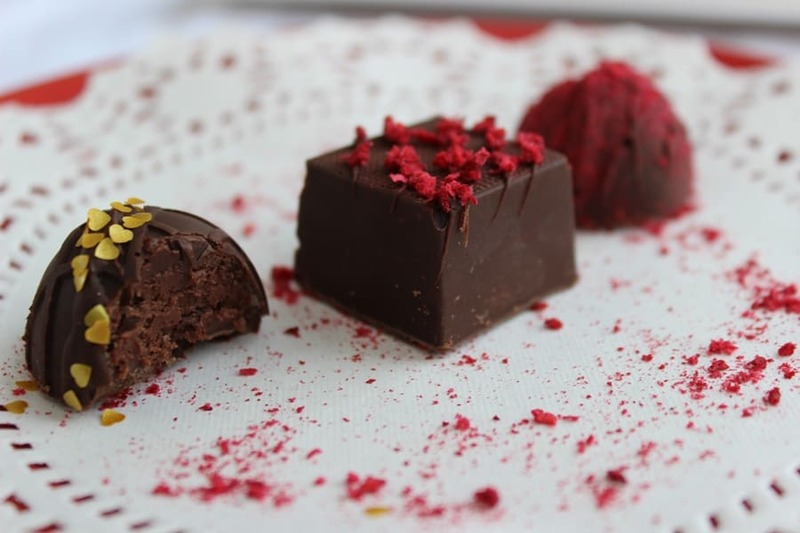 Because these homemade chocolate raspberry truffles are as natural as possible, made with no chemical hardeners, you’ll want to store them in a cool place. They melt easily in your hands. The best way to melt chocolate is with a double boiler. You can certainly buy a fancy double boiler, but you can also easily make your own. To make your own double boiler, take a saucepan and pour 1-2 inches of water in the bottom. Place a metal or tempered glass bowl on top of the saucepan so that the bowl overhangs the rim of the pan. The bowl being bigger than the rim of the pan will prevent steam from escaping the saucepan. The chocolate will go into the bowl, where it will be gently melted. If you melt it unevenly or too quickly (like in a microwave), it can cause lumps, burning, or discoloring in your truffle. A more direct heat would be too harsh for the chocolate. Pin this truffle recipe now to your Keto Dessert board! Another word of caution: don’t let any steam or water from your pan get into the chocolate. It can also make it lumpy and they won’t be as pretty! Don’t let any of this scare you, though! Even if your chocolate turns out blemished, they will still taste just fine! And you can always put more decorations on them. No one will ever know. But honestly, if I can do it you can too! 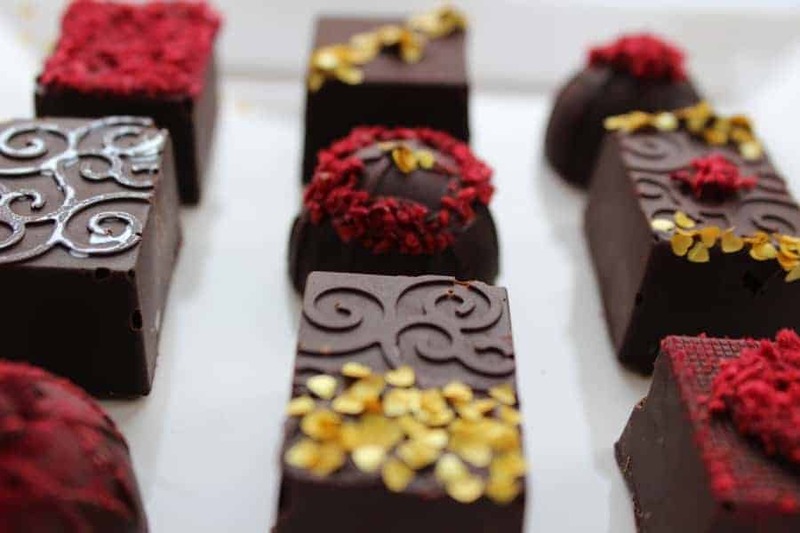 If you want a nice flat bottom to your chocolate raspberry truffles, be sure to scrape them level after pouring the chocolate into the truffle mold in the last steps. This will ensure that the bottom of your truffles aren’t lumpy and will sit flat. 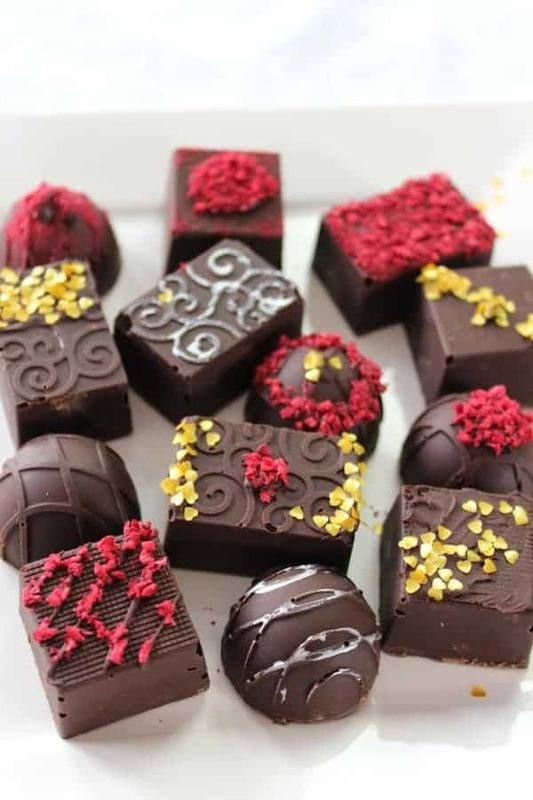 If you’d like to add a bit of decoration to your truffles, you can place a small amount of melted chocolate or leftover ganache on top of the truffles and then sprinkle whatever decorations on that you’d like. 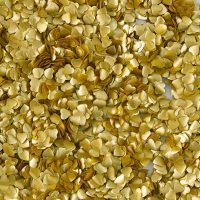 I like to use freeze-dried raspberry crumbles or some gold flakes for an extra special touch. There are two ways you can do this. The first way is to crumble the raspberries with your hands for bigger crumbles. Or you can put a few raspberries in a plastic sandwich bag, lay the bag flat on the counter, and roll over the bag with a rolling pin. Allow the finished truffles to set at room temperature for about an hour. If you don’t eat them right away, be sure to refrigerate the truffles within 24 hours. If you like this recipe give it a 5 star rating in the comments! Pastry bag: A pastry bag is nice, but not completely necessary. I’ve gotten by just fine using plastic storage baggies. The gallon sized or freezer bags are thicker, so I recommend using those if you don’t have a pastry bag. Silicone mold: If you need a truffle mold, you can purchase the one we used or skip the coating part and just roll the chilled ganache in whatever topping you’d like. A popular topping for truffles is cocoa. In the first experiment for these truffles, I had a ton of ganache left over, so my kids had a blast rolling it into balls and dropping them in sprinkles and cocoa! The ganache is the best part anyway! Chocolate: Dark chocolate pairs really well with the raspberry flavor. If you prefer milk chocolate, go for it! Also, Sometimes when making keto chocolate raspberry truffles, I use half sugar-free chips and half baker’s chocolate. Experiment and find out what you like better, and don’t forget to come back and let us know if you tweaked the recipe at all! 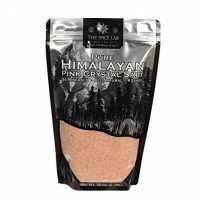 Freeze-dried Raspberries: The freeze-dried raspberries are genius if you ask me. And I can say that humbly because it’s not my idea. 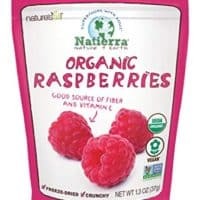 Freeze-dried raspberries are used in many conscientious whole food recipes for a bit of color. When crushed, a little bit of raspberry goes a long way, so you won’t be adding a ton of carbs. LOOKING FOR MORE KETO TREAT IDEAS? 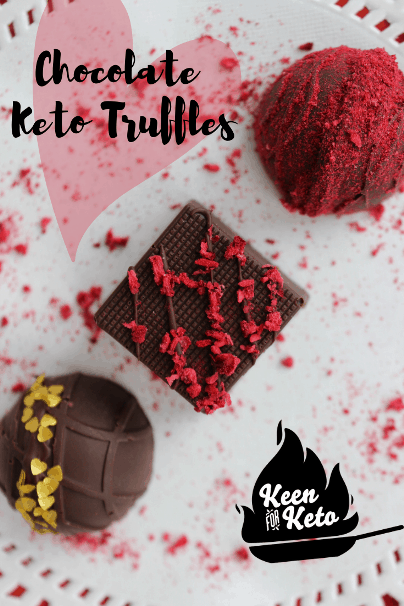 Keto Chocolate Raspberry Truffles are the perfect low carb candy or ketogenic dessert to make for your significant other this Valentine's Day! Sugar free raspberry chocolate filled with a creamy chocolate raspberry ganache truffle center and decorated however you like. Easy and gorgeous! Place dark chocolate in a medium bowl. In a small saucepan, heat heavy whipping cream over medium heat until boiling. Allow to boil for one minute, no longer. 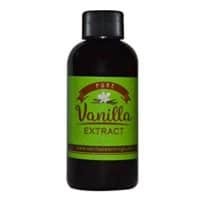 Remove from heat and add stevia, raspberry extract, vanilla, and salt. Pour cream over the chocolate and cover bowl with plastic wrap for about 5 minutes (you can start melting the chocolate for the coating while you wait). Stir the chocolate gently with a rubber spatula. 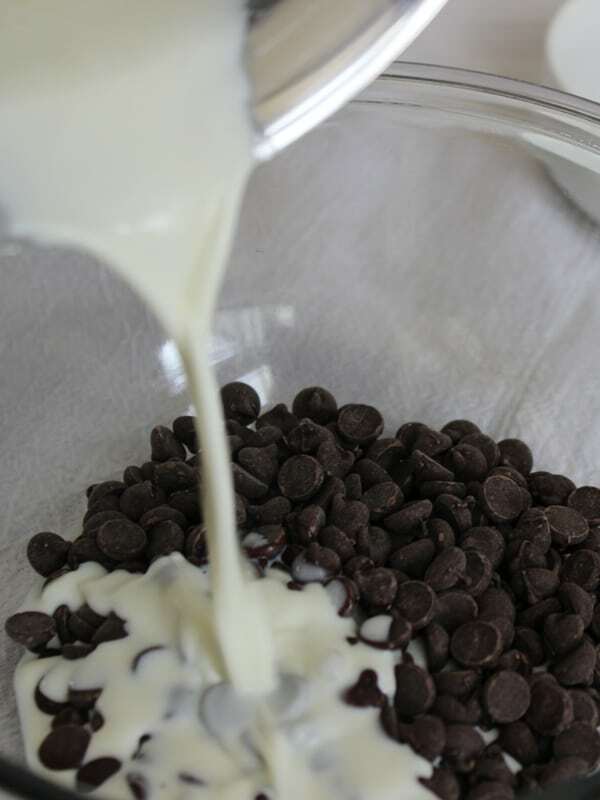 If the chocolate hasn’t melted into the cream completely, cover it back up and allow it to sit and melt longer. Add the butter and gently stir into the chocolate mixture. 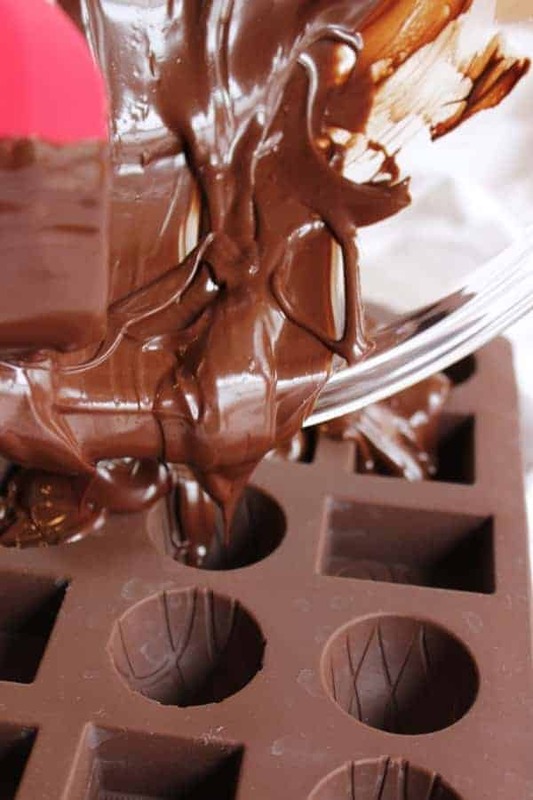 Melt ½ cup of the chocolate in a double boiler over medium heat, being careful not to drip any water into the chocolate. Remove from heat and add the remaining chocolate to the bowl. Add the raspberry extract and coconut oil and stir gently with a rubber spatula. If you don’t stir gently, air bubbles may get into the chocolate. Holding your silicone candy mold over the chocolate bowl so that any leftover chocolate can drip back into the bowl, spoon the chocolate into the molds until they’re completely filled. Gently tap the bottom of the mold till you can see bubbles coming up from the chocolate. This will prevent bubble indentations in your finished chocolates. Allow the mold to sit for about 2 minutes, or until you begin to see the chocolate thickening just around the outside. Tilt the mold slightly over the chocolate bowl and allow the excess chocolate to pour out into the bowl, leaving just a shell. Use a flat metal utensil or rubber spatula to scrape the excess off into the bowl, being careful not to disturb the chocolate shells you’ve just made. Allow the mold to sit undisturbed on the counter till it’s starting to set up a bit, but not completely (about 5-8 minutes). Add about half of the ganache truffle filling to a pastry bag. Pipe the ganache into the chocolate shells that you’ve made with your mold, being careful not to fill them all the way (you’ll be using the rest of the chocolate coating to cover the ganache). Holding the mold at a tilt over the chocolate bowl again, spoon the chocolate into the molds, filling them the rest of the way. Scrape the excess away into the bowl as before, being careful not to scoop into the chocolate molds. Try to make as level of a scrape as possible so the bottom of your chocolates will be flat and not lumpy. Allow to set at room temperature for about an hour. If you don’t eat them right away, be sure to refrigerate the truffles within 24 hours. Add a dab of melted chocolate wherever you’d like to put your decorations on the chocolate truffles. Sprinkle the toppings on and admire your work! 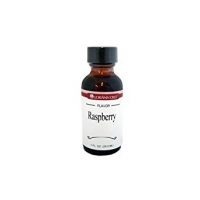 Lorann Oil Raspberry Royal Super Strength Flavor Oil - 16oz. 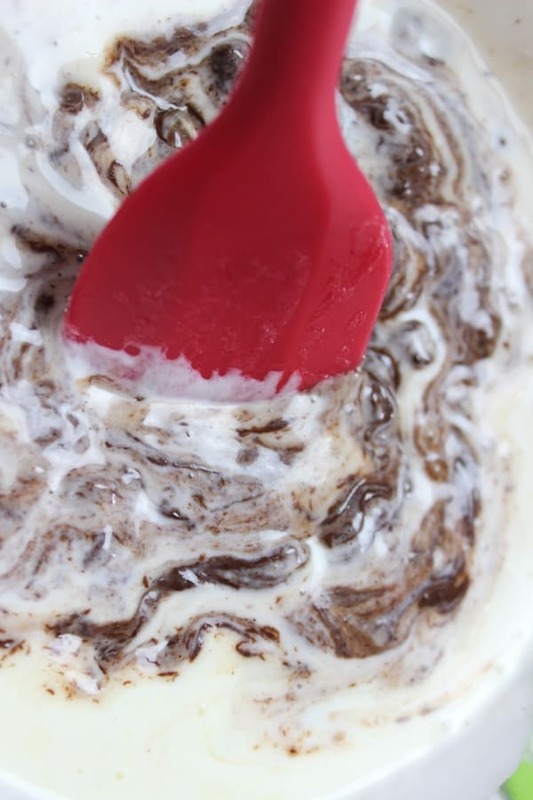 Save this recipe to your keto dessert Pinterest board for later!